This word "Threshing Floor" is closely related to farming. As the verb imply, thresh means to separate grain from straws, husk or chaff. Thus, Threshing floor refers to a/the place where separating of straws, chaff or husks from grains take place. It is usually a flat, hard-packed area on a hillside or hill top, where breeze were strong in late afternoon and early evening. 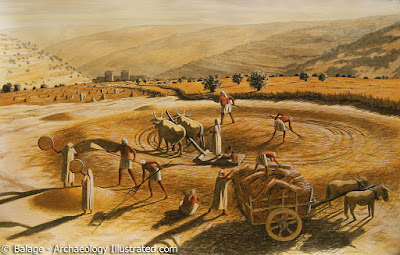 It is not compulsory that a threshing floor must be on an hillside or hilltop. Any place can be used as a threshing floor, provided their is strong breeze (not wind) their. This is necessary so that when workers/farmers use their big forks or shovels to toss the mixture into the air, the chaff, straws and husk which are usually lighter will be carried off by the breeze, allowing the heavier grains to fall bak to the floor/ground. A threshing floor is a place where farmers separate their grains from chaff, straw or husks. The place a farmer will decide to use as a threshing floor is mostly determine by the amount of breeze available there, usually during late afternoon or early evening after harvesting.